Look carefully around the Centre and there are small encouraging signs that spring is just waiting in the wings. 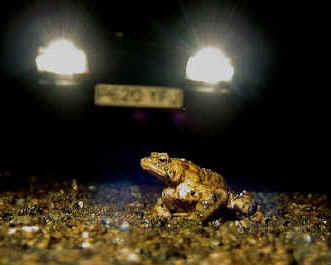 This is the time of year when amphibians such as frogs and toads, begin to emerge from their winter shelters. Frogs usually lay their eggs a little earlier than toads. They have been spawning since late January and their masses of jelly-like eggs are visible in most of the aquatic habitats on the reserve. The frogs precede the toads who arrive to spawn some weeks later, often in their thousands. 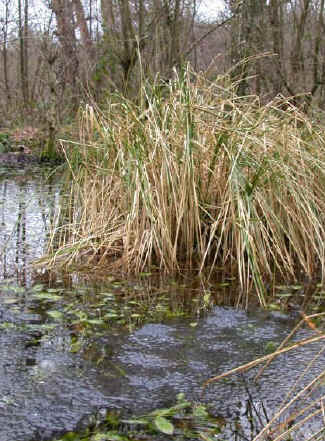 (left) Frog spawn in the Marsh Area. Early on in the gathering, you may see many of the male toads sitting bolt upright on the tracks at night, in the hopes of latching onto a passing female. For a period of two to three weeks, particularly on warmer nights, visits to the ponds, wetlands and lake will usually produce sightings of scores of toads all about their business.